I’ve published three dead-tree books, and 4 eBooks. 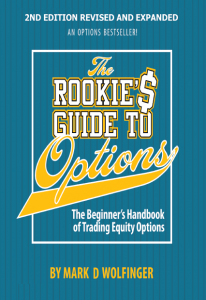 I strongly recommend The Rookie’s Guide to Options, 2nd edition (2013). In my (biased) opinion, the first edition is destined to become a classic primer. Read those reviews at amazon.com. They are genuine. The 2nd edition is now available as an ebook (.pdf or Kindle). See details below. Although written for the beginner, there is enough advanced material to make this book useful for years to come. When writing The Rookie’s Guide, I provided extra detail, just as I do in my blog posts. Why? To anticipate questions and perhaps answer them – before you ask. I explain why calls and puts are interchangeable when you buy or sell stock with the options, and that some positions are equivalent to others. This type of information is not available in most books targeted to rookies. Understanding this single chapter places you years ahead of most novice option traders. There’s much more to say, but the reviews and testimonials speak for themselves. The paperback version sells for $27 retail, and amazon is offering a discount. I offer a FREE sampler version of the first edition that contains a very short excerpt from each chapter of the first edition. This book has been downloaded more than 13,000 times and offers a good idea of the contents of the full book. The .pdf (e-book) version of the SECOND EDITION is available for $10. The Kindle version ($9.99) is available at Amazon.com. 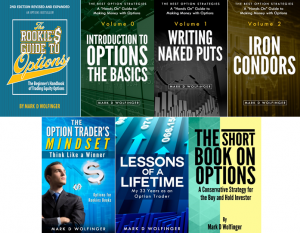 I published my first book, The Short Book on Options in 2002 and it is available as a paperback or Kindle eBook. The Short Book on Options: A Conservative Strategy for the Buy-and-Hold Investor explains the basic concepts of how options work along with a good description of how to write covered calls. If you are looking for an inexpensive way to get started with options, this book is still useful. If you plan to achieve more than just ‘getting started’ status then the Rookie’s Guide would be a better choice. Between these two books came Create Your Own Hedge Fund (2005). By examining the strategies of covered call writing and selling cash-secured puts when using a mix of ETFs (Exchange Traded Funds), I show the individual investor how he/she can own a hedged and diversified portfolio. And that’s exactly how some of the less sophisticated hedge funds operate. You truly can create and mange your own mini-hedge fund. More recently I’ve concentrated on producing new eBooks. Seven are available now, including the Rookie’s Guide to Options. They are available in several formats at your favorite online bookseller. Two e-books are available free. 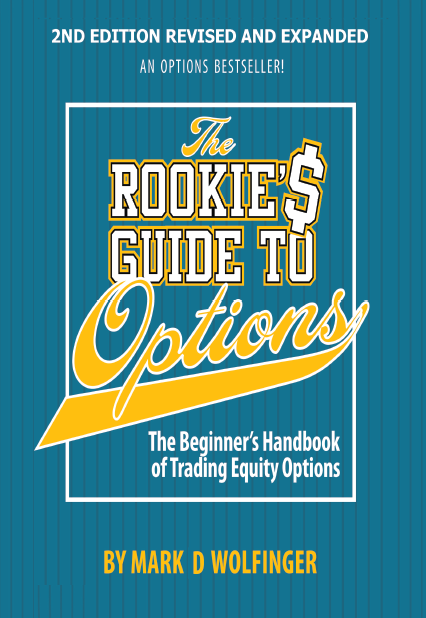 One is a sampler version of The Rookie’s Guide to Options and the other is An Introduction to Options: The Basics. To receive either (or both) books at no cost, follow the link. It takes you to a shopping cart, but don’t let that be a concern. The cost is zero.